The following description was written on the back of this card. "Gateway to Mr Letchworths' Home - 'Glen Iris', Letchworth Park Genesee Valley, New York". 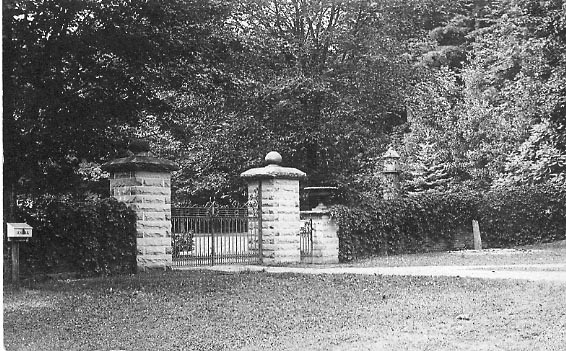 Although the original Glen Iris Gates were on the lawn of the Glen Iris, these iron gates were built on the Plaza level where Pinewood Lodge is now located. The gates and stone pillars were removed some years after Mr. Letchworth's death to facilitate automobile travel - the iron gates have been preserved by the Park.